Simplicity and elegance often go hand-in-hand. 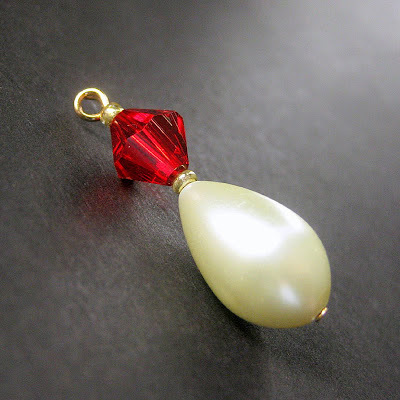 This was never more true than with this beautiful charm designed from a vintage faceted red cabochon and teardrop pearl. Whether dangling from the zipper on a favorite sweater, a cell phone or purse, this charm is sure to add a touch of elegance. The charm measures 1.2-inch (30 mm) in length. Like all of our decorative handmade charms, it can be attached to a number of different fasteners and our customers get their choice in which kind of fastener they'd like attached when they order.